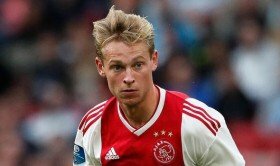 Barcelona to swoop De Jong ahead of rivals? Barcelona are reportedly growing confident of signing in-demand Ajax midfielder Frenkie de Jong ahead of Manchester City and Bayern Munich. The Dutchman has been widely fancied for a big-club move since the summer but so far, Ajax have resisted the prospect of cashing in on his services. However, according to Mundo Deportivo, the Blaugrana are leading the race after agreeing to meet De Jong's wage demands while the Dutchman is also said to favour a move to the Spanish La Liga. De Jong's agent has recently suggested that the midfielder's future could be sorted in the coming weeks but a mid-season deal still appears unlikely with Ajax maintaining a not-for-stance for the winter transfer window. Ajax are still alive in both their domestic and European competitions and they most recently reached the knockout phase of the Champions League for the first time after 12 years. Meanwhile, the Amsterdam-based side are right in the league title hunt this term and just two points separate them from table-toppers PSV Eindhoven at the half-way stage of the season.